Pop over to Junque Art to find a list of participating blogs showcasing a favorite vintage collection today. I have too many collections, but decided to share my vintage Ransburg with you today. The Harper J. Ransburg Company of Indianapolis, Indiana produced hand-decorated colorful household accessories that were sold in retail outlets across America. 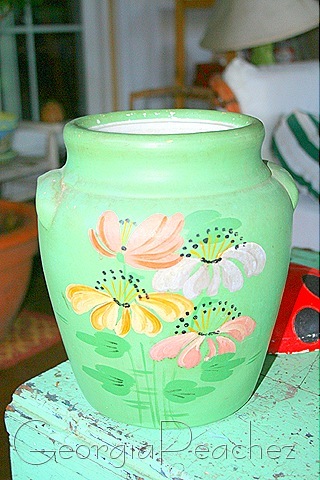 The Ransburg Company sold hand-painted stoneware and later hand-decorated metalware from the 1930's through the 1960's. There are many, many design motifs but you see several examples of the most popular here, Asters. The tomato red is probably the most common color. I love the jadite green myself. The hollyhocks design is also a personal favorite. This design is Water Lilies. 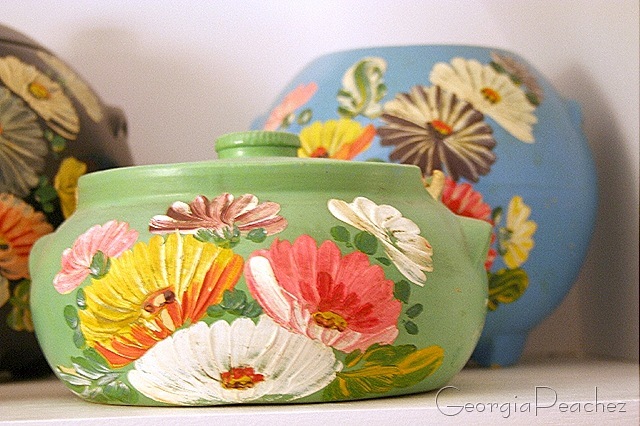 Often you will find the cookie jars without their lids as they were usually broken. You probably guessed, this design is called Daisies. Ransburg metalware was also very popular and you might even have a Ransburg tin in your collection. Next time you are in the antique mall, keep your eyes open. There is almost always some Ransburg to be found. You’ve got the best collections, Suzy! I honestly didn’t know they made stoneware; I’ve only seen the metalware. I like the stoneware even better! Those are striking! Who wouldn’t love a shelf full? Very cool! I almost always learn something new reading your blog!! Thank you! Uh oh I may have to start a new collection! Those are so pretty! I didn’t even know Ransburg made stoneware – very pretty collection. 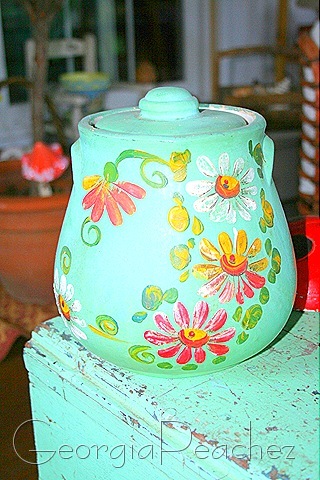 I have some Ransburg metal trash cans, kleenex containers, trays…love the ‘tole like’ painted flowers. Love, your stoneware! Love your blog banner! And love the altered Shiny Brite bozes in a previous post! What beautiful pots. I love the colors and the flowers, such a cheery collection to enjoy! Thanks for sharing. Oh, Ransburg is one of my favorite companies! I have a metal canister set with birds on it, 2 painted metal canisters and a matching (very rusty, boo) wax paper holder, and a black metal floral trash can… Thanks so much for sharing your collection, I love it! So vivid and pretty. And looks just like you, Suzy! So very pretty and cheery! These are new to me and I’m glad you showed them here. Thanks. I never knew about Ransburg items – thanks for sharing, you have a wonderful collection! awesome collection in beautiful colours! thanks for sharing & happy sunday! It’s 3:20am……why didn’t I just go to bed rather than pop on the computer and see your awesome collection. I don’t need to start collecting anything else…but dang I’m lovin’ your pottery! What a gorgeous collection! I collect Ransburg, as well, but I have mostly tins and canisters and just a small number of the pottery/crockery items. But I love them all, and yours are just beautiful. I’m a Ransburg collector myself! Yours are lovely. Wow I just love this collection of yours! They are so bright and cheerful with color. The flower patterns are just great! I will have to keep my eye out for these in the antique stores. Are they marked on the bottom? Really really like them! They would go great in my kitchen…hmmm. Thanks so much for taking time to share your collection and play Show & Tell Sunday with us! !